I love this picture of my studio room. As you can see, there is a lot crammed in there but...it is my room. 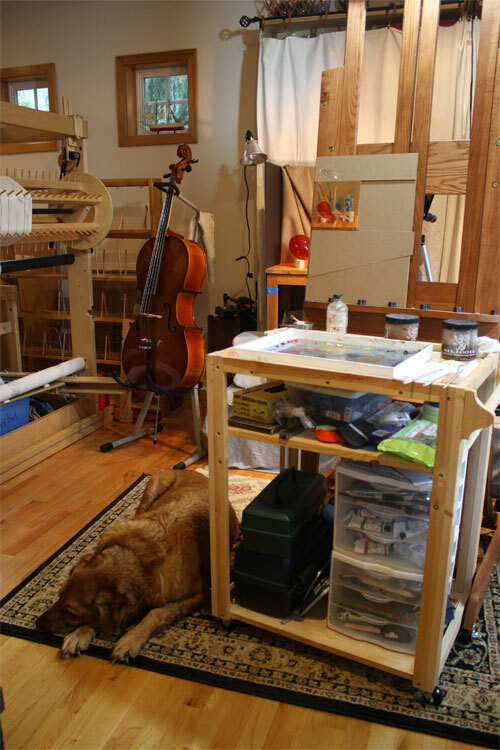 In this picture you can see the back of my rather large loom on the left, my cello awaiting practice, my beautiful studio dog Twill, and cart, easel, the previous painting in progress and a glimpse of the still life set up. What you can't see is that the set up is on a table which in turn is on a small model stage. the curtain covers art supply storage on one side and still life props on the other. It is a lovely room although a bit cramped. 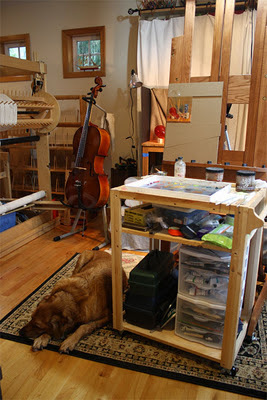 One day I would love to have the loom set up somewhere else and an expanded art studio. Yes, a dream studio would be wonderful. Hopefully in the coming years. I have the next still life all set up but have taken a bit more care on this one. It doesn't look like much as you will see in a future post. I am taking more time to study up on composition, lighting, and the plain mechanics of painting. I have had to teach myself how to paint and it is still very much a work in progress for me. I must add a note here though. I was fortunate to have a year to study drawing at the Ashland Academy of Art. 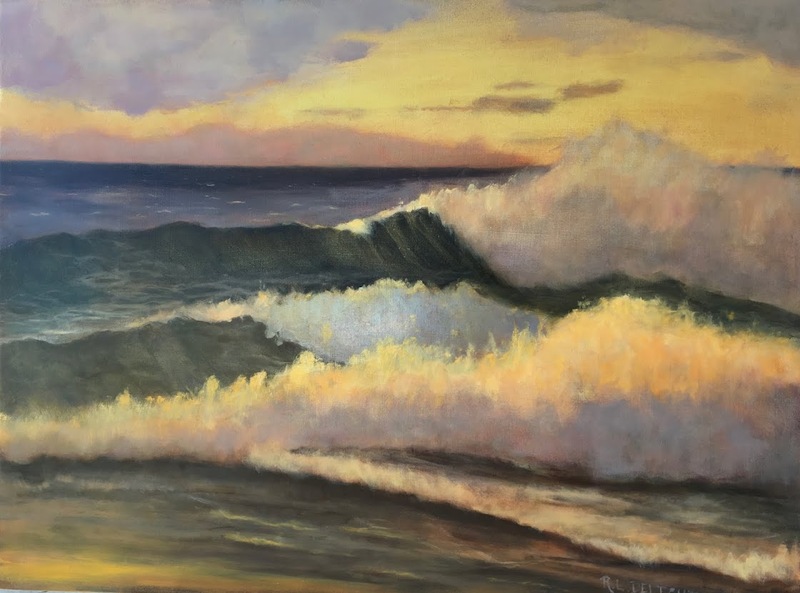 If I had decided to move to Maui with them, I would have learned how to paint there and would be half way through my third year. I was just starting grisaille when the year ended. That year of drawing was probably the most important chunk of learning I did. I am also practicing a few paint handling and brush work techniques before starting in. I had planned to sail into the painting today but...the weather is turning warm. Not a usual thing to happen here in February, the middle of winter. Why did that keep me from painting? Well, the warm weather gives me a chance to paint outside, en plein air! This time of the year the light is very intriguing because the sun is so low in the sky. The next few days will be warmish and dry so I will drop the studio work for a few days to take advantage of it. I have an idea for an exciting series with will fit in neatly with the other work am doing. I spent today getting the work I need to do to make that happen. Painting outside is a big part of that and I needed to be prepared for tomorrow. I am not going to say anymore at the moment. I will unfold it for you as it happens. I am so excited! There will be more to post about on Sunday. I have been so busy with getting things in place, I haven't gone to life drawing in a couple of weeks. I am planning to go this week so I don't get totally out of practice. Until then, I will be making hay, or in this case, painting while the sun shines! Unleash all that excitement and paint on! Looks like a good run of nice days. FWIW, we do usually get a little spring thaw weather about this time and then it gets gloomy again. Of course this winter has been a strange one so who knows. Love the studio and of course, Twill. Pets and hugs to all.